Vermont, ranked 45th in terms of total area, is located in the northeastern part of the United States of America. Vermont is bordered by Canada, New York, Massachusetts, and New Hampshire. Its capital is Montpelier while its largest city is Burlington. The state is also known by its nickname, The Green Mountain State after the mountain range. 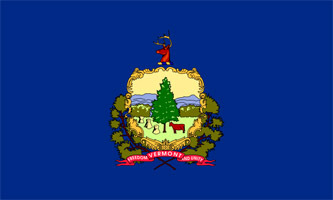 In fact, the name Vermont was derived from the French translation of green mountains or “verd-mont”. The state is blessed by natural resources such as mountains, fertile valleys, rolling hills, rivers, and lakes. Major mountains are Killington, Mt. Ellen, Camel’s Hump, and Mt. Abraham. Major rivers include the Missisquoi, Lamoille, Winooski, White, Otter Creek, West, and the Battenkill rivers. Major lakes are Memphramagog, Willoughby, Bomoseen, St. Catherine, and Champlain lakes. The state is the leading producer of maple syrup in the United States, accounting for 37% of the national production. Perhaps it is due to this that the state has an official flavor – maple. It is actually the only state in the country with an official flavor. Other agricultural products produced by Vermont include milk, organic vegetables, cheese, butter, ice cream, ginseng, chocolates, flour, and wine. Tourism is another key player in the state’s economy particularly the ski resorts. Vermont is the birthplace of presidents Chester A. Arthur and Calvin Coolidge. Other famous people who were either born or lived in Vermont are Charles Francis Adams, Ethan Allen, Pearl S. Buck, Robert Frost, Phineas Gage, John Irving, Rudyard Kipling, Sinclair Lewis, William H. Macy, Annie Proulx, Joseph Smith Jr., and Alexander Twilight.